1 The establishment of the Gawler History Team Inc. The establishment of the Gawler History Team Inc. The Gawler History Team [GHT] Executive have asked me to record the evolution of GHT for posterity. In May 2011, I asked a guest speaker at the Gawler Institute, on the subject of embracing “communication”, for her thoughts relating to “history” and “youth” and she recommended using a medium that youth can easily relate to. My concerns that much of Gawler’s photographic history was not easily accessible, buried in people’s homes, and generally not being shared, prompted my realisation that (a) there were many in Gawler having similar concerns and (b) that the answer probably encompassed the use of one’s computer and the Internet. Her advice inspired me to raise the issue with Gawler National Trust Chairman Dr David Tucker and his son-in-law Michael Hemphill [who has computer experience] and this meeting had the resolution to create a mailing list to 30 or so Gawler residents who might attend a convened meeting. I then spoke with Ian McDonnell who suggested we contact Nicole Stomaci. It was evident that the combination of the passion and expertise of Ian, and Nicole’s past association with the Mallala website was essential for success and we are very fortunate that they quickly embraced the prospect of being involved. Invitations were sent out for attendance at a meeting in St Georges Hall. On the 10th August a number of us went to see the Mallala Museum [running the mallala.nowandthen.net.au website of Mallala’s history] and this prompted discussions with Darren Peacock of Sweet Technology who created the NowandThen template. We adopted the stance that “If it is not broken then don’t fix it”, as it was evident that the Mallala wiki template would be ideal for Gawler History Team to use. The first GHT meeting in St Georges Hall, Cowan Street, Gawler was held on 15th September 2011. Those in attendance were Brian Thom, Michael Hemphill, Darren Peacock, Bill Woods, Ian McDonnell, David Tucker, Anne Richards, Michael Denison, Joan Denison, Robin Richter, Adrian Shackley, Helen Wilmore, Helen Hennessy, Pat Fabian, Stan Roulston, John Clift, Glennys Carse, Graham Tucker, Bev Burke, Paul Barnet, Paul Koch, Robert Laidlaw, Jarred Sharp and Nicole Stomaci. I asked that we be called the Gawler History Team [rather than a Group or Society] as the word “Team” embraced the concept of “bringing people together to embrace Gawler’s heritage and to create a special ambience” and to work collaboratively together to build a special website. We resolved to engage Sweet Technology, to have a Constitution, to have appropriate Public Liability Insurance and to become an Incorporated Body. The first Thursday in the month regular meeting took place on 3rd November 2011 and Gawler History Team became an incorporated body A41209 on 7th November 2011 with Adrian Shackley accepting the position of Public Officer. The initial Committee had Brian Thom as Chairman, Michael Hemphill as Deputy Chairman, Anne Richards as Secretary, Jarred Sharp as Treasurer, and Board members Nicole Stomaci, Ian McDonnell and Stan Roulston. The gawler.nowandthen.net.au website was officially launched on 27th May 2012 in the Gawler Institute by Dr Bruce Eastick. Nine months ago, the contemplation of writing an AGM Chairman’s report was not on the horizon, yet it is done now with great pride and pleasure. What a great deal has been achieved in that time: Gawler History Team created, GHT being now an Incorporated body, many thousands of old pictures gathered, and a sufficient number of articles created to justify a launch of the Wiki on 27th May. We acknowledge the expertise and effort of Darren Peacock who has created the “nowandthen” programme which we have taken up. Thank you for your patience and support Darren. The Launch date and format was very timely and to have 150 people in attendance was a real plus, with lovely positive vibes emanating from the event. The happiness continued over snacks and drinks at The Southern, where many of the Team gathered to celebrate our achievement. It is always a bit dangerous to single out any particular member of any Team, but I would be remiss not to acknowledge the magnificent effort and contribution Nicole Stomaci has given to fast-track the creation of our Wiki. Nicole, you are a gem and I am confident that all Team members would echo the thanks and appreciation now given. What I am proud of is the lovely mix of people we have, who are enjoying “doing their bit” to progress the project. Some will always do more than others, but that doesn’t matter, as every contribution is important. The challenge we have for the next 12 months is to capitalize on what we have so-far accumulated, so that every week, our audience can see what new sets have been added so that they too can appreciate our discoveries and efforts. What we need to do now is to re-assess our priorities and focus on those sets of pictures that can now be outsourced to Wiki. Thank you all for being a Team member wanting to “do their bit” and I trust that you will get much satisfaction out of seeing your efforts “up on the big Wiki screen” over the forthcoming 12 months. It has been a great pleasure to be your inaugural Chairman. Gawler History Team’s first full year has been very fruitful; with increasing membership, great guest speakers and interest in our Wiki project ever increasing within our community. I would like to thank your Executive Team of Deputy Chair Nicole Stomaci, Secretary Anne Richards, and Ian McDonnell, Robert Laidlaw and Stan Roulston for their great support to me and their guidance toward our project development. I thank Raff Stomaci for his role as Treasurer. Circumstances have sadly arisen which have forced Stan not to continue on the Executive and we wish him and Iris well for the future. Stan has intimated that he will continue to submit copy and photographs for the Bunyip to publish each week and we thank him for his past and future valuable PR contributions. Paul Barnet has taken nearly five hundred photos of Gawler’s heritage homes and his work ethic to enhance our Wiki has been inspiring. Many thanks Paul. I also thank Editors Rob McLean (Bunyip) and Graham Fischer (Barossa Herald) for their willingness to advertise the details relating to each monthly guest speaker, as submitted each month. In February 2013 Nicole explained our Wiki and in May 2013 we hosted a very enjoyable 75 question quiz night compiled and conducted by Ian McDonnell. Darren Peacock’s role as our technical guru is always valued and we thank him for his ongoing efforts to maximise the effectiveness of GHT’S Wiki and Flickr; albeit him being frustrated in recent months while expecting his service providers to respond more professionally. Darren has taken steps to greatly improve our Wiki’s effectiveness, and readability. I have been constantly mindful that Nicole’s (almost daily) wonderful dedication to her role (of inputing all the material submitted) has been overwhelming at times. I am adamant that she needs support; by her having a reliable 2IC. Recruiting steps have been taken that, hopefully, will soon reduce her workload, as well as creating an effective back-up person for her. We will continue to undertake all the Team’s business matters through monthly Executive meetings so that at our monthly Team meetings we can enjoy interesting guest speakers, blended with workshops. As to the future, 2014 will be Gawler’s year 175, and I envisage that even greater interest will be experienced relative to our history. As such, I urge every member to make the most of the next 6 months to make the effort to ensure that our thousands of Flickr photographs have an appropriate article produced so that they may be properly attached to our Wiki. This 175-year of celebration for Gawler gives us the opportunity to further enhance our advertising of the Wiki’s existence. I will be seeking greater business sponsorship for the site so that we have the money to effectively increase our communication to the public. Gawler History Team’s second full year’s growth has been a joy to behold; with increasing membership and excellent guest speakers - having an average of about 48 at meetings (the record monthly attendance number was 60). Interest in our Gawler History website is ever-increasing within our community. We appreciate our technical expert and guiding light, Darren Peacock (Sweet Technology), who has advised that in the 2013/14 financial year we got 16,000 visits to our website from 11,550 individuals, with over 1.2 million hits to our Flickr; up 93% from last financial year. I would like to thank your Executive Team of Deputy Chair Nicole Stomaci, Secretary Anne Richards, and Ian McDonnell, Robert Laidlaw, Paul Barnet and Mike Denison for their great support to me and their guidance toward our project development. Sad to hear that Anne Richards is not standing for re-election as Secretary. Thank you for your input from the Team’s inception, Anne. Your counsel has been most valuable and you will be sorely missed. I thank Raff Stomaci and now Michael Denison for their role as Treasurer, and Lance Hatcher, our honorary Auditor. Nicole’s input to our website has continued to be invaluable and Helen Clark has thankfully volunteered to take on Nicole’s role following the Stomaci family decision to tour Australia for 6 months. We thank Helen for her enthusiasm, following her spending 3 months organising Willaston history; with a very commendable outcome. Stan Roulston continues submitting copy and photographs for the Bunyip to publish and we thank him for his valuable PR contributions. Paul Barnet has taken 760 photos of Gawler’s heritage homes and his work ethic to continually enhance our Wiki has been inspiring. Many thanks Paul. Paul was nominated for a SAHistory Council award. Ian McDonnell has spent over 60 hours scanning our historic photographs by using our new A3 scanner; 150 or so photos are now displayed in many Gawler and Willaston business locations; being GHT’s contribution towards Gawler175 celebrations. Positive feedback has been received. Well done Ian. I also acknowledge the tremendous contribution made by Audrey Clark and Chris Hanley who scanned all of the Gawler High School Year-books since 1933. Their volunteering to do that was much appreciated and the preservation of this Gawler history is a great achievement. I also thank Editors Rob McLean [Bunyip], Graham Fischer [Barossa Herald] and The Leader editors for their willingness to advertise the details relating to each monthly guest speaker. July, John Clift [Gawler’s first settler John Reid and the first 25 years of Gawler]. I have secured some Guest Speakers already for 2015 and would welcome your suggestions at any time. 2014 is Gawler’s 175th year, and I am thankful for the Town of Gawler’s co-operation by creating on its Website’s front page a “Historic photos” link to our Wiki. We will continue to undertake all the Team’s business matters through monthly Executive meetings so that at our monthly Team meetings we can concentrate on enjoying our interesting speakers. We acknowledge the strong and valuable financial support given by our 18 Official Sponsors and we trust that they will continue with us during 2015. 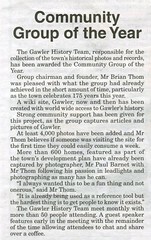 Thank you all for making this last year very special, Brian Thom, Chairman, Gawler History Team Inc.
We have experienced a busy 12 months and have now reached the milestone of having nearly 16,000 photographs etc loaded onto our website to display Gawler’s rich heritage. Recent collaboration with the Town of Gawler has resulted in approximately 1250 of their old photos being added to our website www.gawler.nowandthen.net.au and we applaud Council’s agreement and intention that further such collaboration should regularly occur. Thanks to those members who volunteered to explain our mission to display Gawler’s heritage at our stand at the Gawler Show and Rotary Village Fair. 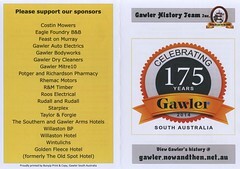 We are proud to have such a great number of Gawler businesses showing such willingness to be a Sponsor of Gawler History Team, and from our Sponsors advertising on Wiki, we have been able to purchase a new computer, new projector, a new hard drive, and a new negative film scanner; all of which has increased our efficiency when addressing the various Groups and Clubs around Gawler. Special mention is appropriate to record the magnificent assistance Keven Evans from Roseworthy has given us over the last three years. Keven has provided us with probably 60% of our collection of Gawler photographs and articles. Keven displays remarkable and noteworthy passion towards the proper preservation of Gawler history. Ian McDonnell deserves special thanks for the time he has taken to produce the many historic A3 photos that have now been put up in Gawler shop windows. Many favourable comments have been received from those taking the time to view and enjoy them. Further, Ian has put hundreds of Gawler photographs onto USB sticks and these have been given to all of the Aged Care and Nursing Homes in the area. [This initiative has been warmly received by the proprietors of these facilities soas to further improve the quality of life of the guests under their care.] The countless hours that Ian McDonnell has constantly spent over the year to further improve our website has been unbelievable. We thank Ian for his dedication. Paul Barnet has basically completed his quest to photograph every heritage place listed in Town of Gawler’s Development Plan. Nearly 900 photographs taken over the last 3 years by Paul is a testament to Paul’s dedication to this complete this very important task. Very well done Paul. Thank you. Plastic folders containing our Gawler History Team explanatory leaflets have been placed in 25 locations in and around Gawler and are replenished when needed. Our thanks go to Mr Lance Hatcher for being our Auditor and his willingness to continue with this role in the years ahead. Michael Denison is to be applauded for his diligence as Treasurer. With Nicole being absent for 9 months, thanks to Helen Clark for her assistance in loading onto Wiki. Nicole and her family safely returned and we thank Nicole for her ongoing dedication to further the improvement of our website showcasing Gawler’s rich heritage. To our Executive Team, Deputy Chairperson Nicole Stomaci, Secretary Ray Hicks, Treasurer Mike Denison, and Committee members Robert Laidlaw, Paul Barnet and Ian McDonnell, thank you for your attendance at monthly Executive meetings and for your valuable input towards future planning. It has been a very productive year and I have been proud to be your Chairman. At the October 2015 AGM, Paul Webb was elected to the Executive committee. Welcome Paul. Our 5th year as a Team has experienced great activity and productivity. A further 1600 photographs and articles have been scanned; to reach a new total of 17,600. These include historical Gawler Town Band, Baptist Church, Roseworthy College and Gawler Gumnuts Netball photos and we were fortunate to be given many Marchant’s Studio negatives relating to Gawler in the 1930’s. It is important that such gems have a safe place to be stored and be searchable by anyone in the world. We acknowledge the splendid 18 months of effort achieved by past Gawler resident and GHT member Dr John Stephenson, who, while living near Sydney, has typed up 500 pages of information relating to interments in our Willaston Cemetery since 1861, together with extensive research of the family history relating to each interment. His excellent achievement has resulted in this mammoth output now being able to be displayed on our website, for anyone around the world to research. Such dedication to Gawler is to be applauded. With this and other additions this year, we now have excellent easy access to records relating to Willaston Cemetery [since 1866], Pioneer Park [1839 to 1870 Town of Gawler interments], and St Georges Anglican Cemetery interments [since 1861]. 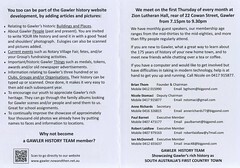 Ian McDonnell has produced Gawler History Team business cards for members to have in their wallet to pass on; encouraging people to explore our website. Ian has diligently produced a collection of 1000 Gawler photos that are stored on a USB as a slide-show. Many such USB’s have now been given freely to all of the Gawler and District Aged Care facilities, some hairdressers, Dentists etc, so that the photos are shown on their TV sets for their patrons to enjoy. Aged Care nurses are experiencing positive reactions from the people they care for. Assisted by Robert Laidlaw, Paul Barnet has collected many historic photographs relating to the Gawler Show for presentation to the Show Committee, while they celebrate their Show’s 160th year. Gawler History Team has continued to support both the Gawler Show and the Rotary Village Fair by having a stand to explain the existence of our website. Several GHT members have commenced scanning of the massive collection of Gawler’s historic material compiled by GHT member Bev Burke over many years. This is a massive project which will result in the ability for all to see many articles and photos that may have become lost to Gawler. We appreciate teenager Pria Rusby’s ongoing effort to type out the details of all of the Gawler Dentists over our 176 years; extensively researched by GHT member Dr. Tony Jackson and excellently presented to us by him at a meeting last year. This project is nearly completed and the many pages of information will be eventually placed on our website. Lorraine Waters has been very active to place Gawler’s history on Facebook and we thank Lorraine for her ongoing commitment. We acknowledge that over the last 5 years, Nicole Stomaci has been stoic in her passion to create our website. Without the many hundreds of hours of commitment by Nicole, we would never have achieved such a magnificent end result. With circumstances changing, we have been conscious of the need to recruit a 2IC for Nicole, so that many hundreds of our photographs etc presently visible on “gawler history flickr” can be transferred to our Wiki, “gawler.nowandthen.net.au"
We welcomed Paul Webb to the Executive Committee. He has selected the project to record why Gawler street names are named as they are. Your Executive have decided to give practical support to a newly-formed “Gawler Oral History Group”. We see this step as being good collaboration, so that together we can expand Gawler historic material for the world to enjoy. July 2016	Pam Edwards	“How life has changed for women in Gawler over the last 70 years”. We are experiencing an average of well over 50 being present to hear our Guest Speaker, peaking at 106 at our February meeting. We thank the Zion Lutheran Church for the use of their excellent Hall for our meetings and “She’s Apples” for creating the lovely baskets which we present to our Guest Speakers. Our Auditor Lance Hatcher has been impressed with the excellent GHT book-keeping done by Treasurer Michael Denison. Your attention to detail and professionalism is much appreciated Michael. I thank the Executive team for their support. We have had many monthly meetings at my home which have produced positive input and vision so that we constantly strive for improvement. “History is made by the people who turn up” is an appropriate statement in relation to our Team of well over 100 financial members. It gives me great pleasure to present this report to you on our achievements and activities over the last 12 months. Brian Thom – Chairman – Gawler History Team Inc.
At the 2016 AGM, following the retirement of Nicole Stomaci, Paul Webb was elected as Deputy Chairman, and Margaret Howse was elected to the GHT Executive. I am proud to say that our 6th year as a Team has produced many good outcomes. Firstly, thanks go to your Executive: Vice-Chairman Paul Webb, Secretary Ray Hicks, Treasurer Michael Denison, and Executive members Paul Barnet, Ian McDonnell, Robert Laidlaw and Margaret Howse (elected at last AGM) who have met each month to express their vision towards positive development of the GHT. When Nicole Stomaci retired at last AGM, her husband Raff Stomaci has taken over to perform the technical duties needed for our website, and we thank Raff for his input. We were delighted that every one of our Sponsors chose to continue their 18 month Sponsorship and we were appreciative of Garner Memorials wishing to be included as a Sponsor. Over the last 12 months we have scanned and loaded many newspaper clippings from Bev Burke’s extensive collection. We thank Bev for sharing these articles and Stan Roulston and Paul Webb for scanning them. These images and many photographs have totalled approximately 2,500 additions for the year; to bring our current total to over 20,250 Gawler images on our website content. We thank Lance Hatcher for his past services as our Auditor and thank Pauline Murray for taking over as our Auditor. We were saddened to learn of the passing of GHT member Philip Tow and we pass onto Margaret our thanks for Philip’s past contributions and our sincere sympathy. Mrs Frisby was a regular attendee at our meetings and her passing was a sad event. Our commiserations go to Roger and Pauline and family. Members enjoyed attending our stand at the Rotary Village Fair which generated much community interest. Our site has been substantially improved by the scanning and loading of the St. Georges Anglican Cemetery Gawler interment details from the 134 pages covering all of the interments between 1861 and 2016. We were then delighted that Trinity College students enthusiastically supported us by their taking of over 600 photographs of each Head-stone/Memorial there. These actions have meant that, together with our extensive details encompassing the old Town of Gawler cemetery in Pioneer Park and last year’s 500 pages of Willaston Cemetery interments [having a head-stone], our site can now provide great help to anyone in the world who wants to investigate their family history in Gawler. We have been delighted that the Town of Gawler website relating to Gawler’s Cemeteries has been substantially improved and we applaud the excellent collaboration given to us and our website by Henry Inat, the CEO of the Town of Gawler and Town of Gawler's IT Manager Slava Grigoriev. We thank Ian McDonnell for spending a great deal of time over the last 12 to 18 months in the pre-production of our new “Welcome to historic Gawler” publication, and thanks also to Adrian Shackley for his substantial positive input. Mayor Karen Redman launched the book on 21st September and we have successfully negotiated for it to be available for sale at the Gawler Visitor Information Centre at 2 Lyndoch Road, as well as it being available from the excellent publisher - Bunyip Print. We have started to have a positive relationship with the Gawler Oral History Group which has prospects for a mutually beneficial outcome. Our December meeting/social evening has been changed to a “Show and Tell” with the invitation for each member to display an interesting item from their home or personal collection. Much interest was generated from these presentations; this becoming the theme for each future December meeting. Our very efficient Treasurer Michael Denison has reluctantly chosen not to continue in this position and we thank Mike for his positive contribution to GHT as Treasurer. We have now scanned every available “Year Book from Gawler High” and this site is now in the top 3 sites for popularity on our website. We continue to have very good attendance to hear our Guest Speakers and all addresses are now visible on the Gawler History Team YouTube for you to access. A big thank you to all who have contributed to make this last 12 months the success that it has been. Chairman – Gawler History Team Inc.
At the 2017 AGM, following the retirement of Treasurer Michael Denison, Cody Davies was elected Treasurer and all other current Executive members were re-elected. I am proud to say that our 7th year as a Team has continued to produce many good outcomes. Firstly, thanks go to your Executive: Vice-Chairman Paul Webb, Secretary Ray Hicks, Treasurer Cody Davies, and Executive members Paul Barnet, Ian McDonnell, Margaret Howse and Robert Laidlaw, who have met each month to express their vision towards positive development of the GHT. Raff Stomaci has performed the technical duties needed for our website, and we thank Raff for his input. We were delighted that our Sponsors chose to continue their Sponsorship and we were appreciative of Bunyip Print wishing to be included as a Sponsor. We have now loaded over 21,100 Gawler images onto our website content. Steps are currently being taken to improve the accessibility of our historic material by the creation of a new gawlerhistory.com website to encompass all the current material seen on gawler.nowandthen.net.au and to overcome current control difficulties. Appropriate publicity of this initiative will be undertaken over the next 12 months. We thank Pauline Murray for her services as our Auditor. Our new “Welcome to historic Gawler” publication has been well received and is available for sale at the Gawler Visitor Information Centre at 2 Lyndoch Road and Trinity College Starplex, as well as it being available from the excellent publisher - Bunyip Print. We were very saddened by the passing of our GHT members Graham Hein, Dr Tony Jackson, Max Duldig and Ross Cook. Their input and enthusiasm will be sadly missed. We continue to have very good attendance to hear our Guest Speakers and all addresses are visible on the Gawler History Team YouTube for you to access. Over the last 7 years our Flickr has had 5,746,000 views; with our Wiki viewed from 67,624 users. A big thank you to all who have contributed to make these last 12 months the success that they has been. Gawler History Team was awarded the Town of Gawler 2014 Community Group of the Year at the Australia Day breakfast. 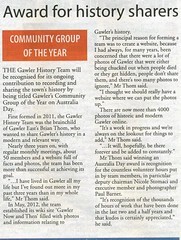 Please click here to see photos of the Gawler History Team. Meeting on the FIRST THURSDAY of each Month [except in January] in Zion Lutheran Hall, 7.15pm, rear of 22 Cowan Street, Gawler. All welcome. We do not have a January meeting. SEPTEMBER 5th 2019 - Adrian Shackley - Pre1839 Flora and Fauna in the Gawler area. OCTOBER 3rd 2019 - David Taplin - The 150 years of Tod Street Methodist Church. DECEMBER 5th 2019 - "Show and Tell" - bring your "items of interest" to show and explain. February 2020 - Paul Little - History of Gawler RSL. August 2020 - David Pitt - History of Gawler Primary School. December 2020 - "Show and Tell" - bring your "items of interest" to show and explain. Do you remember Gawler History Team ? Then Join up and add your memory here.